Who said mud isn’t exciting? I guess the whole “mud” play-on-words is just too dang easy. Just when something as breathtakingly exciting as the transport and deposition of mud makes the headlines (you know you love it), I find myself lacking the requisite time to report about it any better than the stories above, or to blog about it in any great detail (see Olelog’s post here about this research). I would love to dig into this paper and compose a wonderfully concise blog post about the results and implications. Unfortunately, I have some travel approaching and am desperately trying to get a paper submitted before I leave (it’s not looking good). The Schieber et al. paper, titled “Accretion of Mudstone Beds from Migrating Floccule Ripples”, reports results of experimental sedimentary research focused on the finest fraction (<62.5 microns or 0.0625 mm). I have a confession to make. I am a mudist. That word is with an “m”…take another look. In other words, I discriminate against mud. I won’t lie. When looking at sedimentary rocks, I typically skip right over mudstone and shale and go right to the chunky stuff (sand and gravel). Hey, at least I look at the sedimentary rocks at all (I know some of you skip over all of them…shame on you). But mudstone is a HUGE part of the geologic record and has long been under-appreciated, especially with respect to sedimentation mechanics. I think this is largely a result of its tendency to produce craptacular outcrops. The best mudstone deposits I’ve ever seen, by far, were from cores. Nicely cut and polished slabs or cores can reveal the beauty of muddy rocks that outcrops typically do not. Although I haven’t actually read the Schieber et al. paper, the reports about it (including this nice review article by Macquaker and Bohacs in the same issue of Science) summarize the experimental work rather well. In a nutshell, they found that mud can accumulate at flow velocities (i.e., boundary shear stress) higher than previously thought. The fine particles aggregate into floccules, which, in essence, produces “larger” grain sizes. The cartoon at left (from the Macquaker and Bohacs review article) depicts differing processes of deposition (suspension fall-out vs. traction). The lab results from Schieber et al. 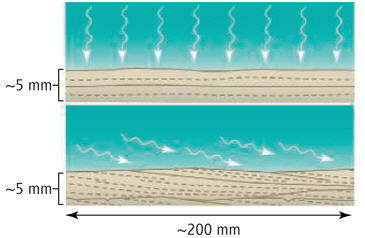 show that traction sedimentation is possible because of flocculation. The implications of this are important because mudstone has long been thought to record “quiet” energy conditions. As usual, it looks like it might be a bit more complicated than we thought. One of my goals over my holiday break is to read this paper in some detail and re-post about it in a couple of weeks. One thing I’m wondering is how important is combined suspension and traction deposition in mudstones? I’ve posted about climbing ripple-laminations before (here), which, in some cases, show a nice succession from dominantly traction sedimentation to dominantly suspension sedimentation within a few 10s of cm of deposits. Is this happening in mudstone deposits and we simply can’t see it? If so, are the patterns similar? I’ll leave you with a quote from the Macquaker and Bohacs review article discussing the big-picture implications of their findings. These results come at a time when mudstone science is poised for a paradigm shift. Observations accumulated over the past 30 years indicate that deposition and burial of mud is as dynamic and complex as that of sand or limestone–or possibly even more so, because of myriad processes–including grain-size changes due to aggregate growth and decay, presence of biofilms, reworking, and cement precipitation–that occur in mudstones to control their variability. Aren’t you excited about mud now? Would you like to know on which of my low energy depocentres I’ve tattooed “I [heart] PAAS”? I under-appreciate mudstone because not only does it make craptacular deposits, but it looks just as craptacular in thin section. But if you’re anti-mudstone, doesn’t that make you an anti-mudist?